It has been about a year since I reviewed the Bulldog, nine months since I reviewed the Route 66 and six months or so since I reviewed the Del Toro. I have liked them all very much. CYYC is one of those rare companies that I can honestly in my opinion say has not released a bomb. When you get a group of guys with combined century of yo-yo experience together to make yoyos, you should expect great products to be produced. The Chico Yo-Yo Company has done just that. Both the Del Toro and the Bulldog are well loved throws. When Thad pulled me aside at Nationals and handed me a Heavy Hitter, I knew I was in for a treat. This is the fourth release for the Chico Yo-Yo Company. In the cleanup position, the Heavy Hitter. 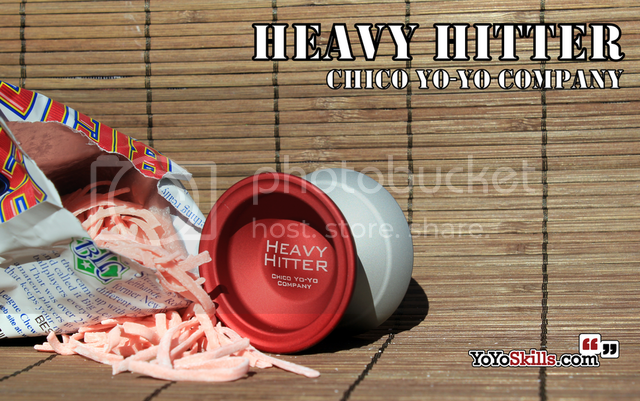 The Heavy Hitter comes in the new Chico Yo-Yo Company display box. The yo-yo sits in custom fit foam and comes with a spare set of response stickers and a string. It is a nice visual introduction for a yo-yo you are bound to be playing with for quite a while. The first thing that struck me about the Heavy Hitter was how clean the lines were. The logo is simple and not distracting, and the colors have a very “polite” feel to them. This yo-yo reminds me of a very expensive, very fine cigar. It does not scream its quality with neon signs or flashing lights, but instead a subdued presence that hits the same buttons as a classic jazz back tempo. Light seems to fold around each curve and corner. This yoyo has personality. The Heavy Hitter has a very soft beadblast finish with the response area masked off. Inside the response area is a deep bearing seat designed to keep grease and string gunk off the side of the C sized bearing. The response sits just outside of the bearing diameter and and will take both flowable silicone or k-pads. Chances are you won’t need them for a while, because the pads CYYC custom makes for their yoyos are great quality and a spare set comes with the yoyo. With a 54mm diameter, the Heavy Hitter qualifies as a full sized throw. In you hand, the 43.8 mm width can feel a bit intimating. The edges feel a bit sharp in your palm and the gap is fairly open so it is hard to get a comfortable hold on it. On the plus side, there is plenty of room for your middle finger to rest inside the gap and your pointer and ring fingers to rest on the rims. There is a step and slope degree change about a third of the way down from the outer edge to the response area. Right before flattening out for the recess, the Heavy Hitter has another slope change slightly raising the response plateau. On the outer edge, there is a curve down before you hit the cup rim. There is a slight undercut behind the rim that should act as a inner ring groove. From there, the Heavy Hitter dips down and then bubbles out on the cup face. This design puts most of the weight just behind the outer rim. With an industry focusing on wide profiles and strategic weight placement, the Heavy Hitter shows signs of deliberate designing. You can just tell that the CYYC brain-trust spent a lot of time tweaking CAD mock ups and contemplating where every gram would fall on this yo-yo. It is like yo-yoing in bullet time. The Heavy Hitter delivers a long hard spin but seems to float through your trick segments with not a care in the world. It is like the scene in “The Natural” when Robert Redford hits the game winning home run, sending it into the lighting system, bringing showers of sparks raining down over the field in slow motion. Heavy Hitter is just that- a natural. At only 67 grams, the Heavy Hitter feels much bigger than it is. The presence overwhelms the need to speed through tricks and instead focuses your attention on the deliberate and floaty movements. I didn’t want to speed it up. As I glided from hop to whip and into a follow, I could feel the stability in this yo-yo. Zero vibration or wobble, just stability, long spins, and a feel that could make rain clouds jealous with floaty rage. Grinds were equally enjoyable. The beadblast finish on the Heavy Hitter allows it to grind very smoothly on your hand and arm. When commanded, the Heavy Hitter climbs up the arm and keeps its vibration free spin. The catch zone shape that made such a great target for hops and transitions won’t trap your arm and die on a grind thanks to the step and slope change. The IRG performed as expected as well. The slight indent under the rim and the open face made for easy thumb placement. I was very pleased with the snappy binds the Heavy Hitter response system delivered. The 4.5mm gap was able to handle quite a few string segments using a standard poly highlight. The play experience was snag free and the stability offered by the Heavy Hitter lent itself to tilt manipulation quite well. There does not seem to be a lot of buzz about this yoyo, which is a real shame. The Heavy Hitter is what I would call an Instant Classic, but seems to be held back by a lack of exposure. You guys will need to take my word on this one; If you are a fan of full sized throws, the Heavy Hitter will be worth every penny. It has a winning combination of style, function, and expertise craftsmanship. The Heavy Hitter is a game winning knock out of the park Grand Slam for Thad, Richie, and Bob. There is nothing I would change about it. The Heavy Hitter is a high five full sized riding dolphins into the sunset. If you desire a full sized throw then nothing should stop you from reaching for a CYYC Heavy Hitter. I love the clear anodized bead blasted look, and the red looks great on the other side as well. Can’t wait to get mine in the mail! 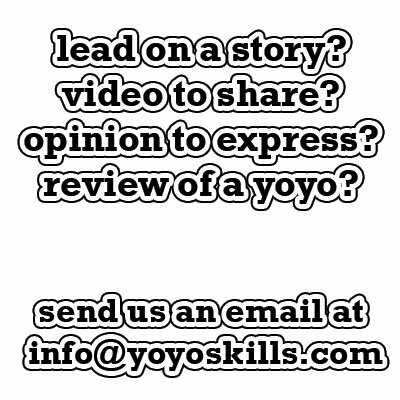 Wow… This yo-yo looks like it has a lot of potential. I would string burn fight for one of them. I’m a proud owner of a Heavy Hitter and a Sky Walker, and this guy destroys a Sky Walker, no offense to any of you Sky Walker fans. Hey Chris you mentioned it was 67 grams at the beginning of the review and in your “on the throw” section you say it’s 65 grams. It is 67g like you first mentioned, I have the specs on my box. It looks nothing like a Skywalker. If you say that because of the step, then everything looks like an 888. Plus, it plays absolutely nothing like a Skywalker. I copped one of these at nationals, almost on a whim, and I’m so glad I did. Yo of the year? I think so. I really want some Big League Chew. I definatley see the resemblance your refering to Brett. But after looking at the different yoyos side by side for a bit i noted a few differences. The sky walker has more pronounced rims and they flatten almost at the tip and , the sky walker also looks alot larger in diameter IE >the pitch/angle of the rims flare out more. and the sky walker doesnt have that little step before the bearing and response area. I think this yoyo looks great! that finish looks like it will grind fantastically! This is the first yoyo from CYYC that has really peaked my attention. looks that kill, bravo. Ps: Sorry about the long-winded comment, hahaha. I just felt like writing a book i suppose…. this yoyo is so much fun. one of the few full size yoyos i like to use. if you play one you will want one…its pretty much like that. Yoyorewind has had these for at least a month now. Kind of annoying that the only way I could order a yoyo made 200 miles away is by paying extra to have it imported from somewhere 25 times farther away. And hopefully they’ll come out with a cooler-looking special edition, similar to what they’ve done with the Bullodog. Cause the current batch is just a bit TOO subdued for my tastes. I didnt mean to offend but it sounded like your telling CYYC that they made a Skywalker duplicate. Eh, I could see the Skywalker resemblance. Looks like an incredible throw! I dont know looks very skywalker-ish to me just bigger. I guess I am blind, just looks really really close. looks like they just made a skywalker with a little difference in the cup area. take a pic of it with a Skywalker if you can.